This week, I didn't lose weight. Well, .2 kilos, or less than half a pound but that's negligible because it fluctuates throughout the day by fractions of a pound all the time. I'm a little bummed but not too badly. I knew this would happen sometimes and that's OK. I just don't want to lose my drive, which feels a little weaker these days. I'm still following the plan but not as super excited about it as I was in the beginning. We went out to dinner this week at my favorite place. I was doing so well. 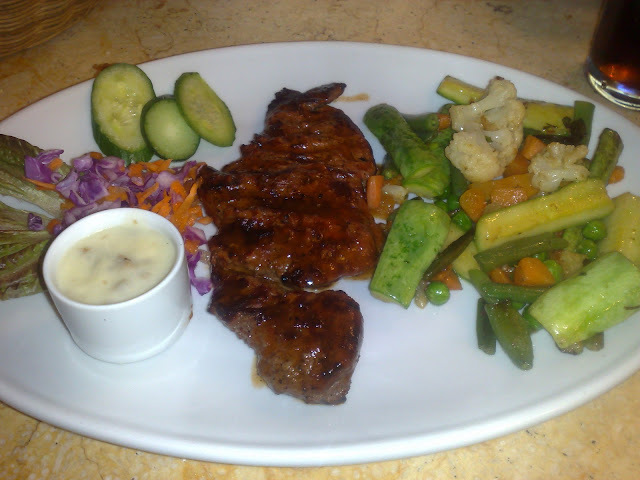 I ate a little of E's Greek salad and I ordered a small-ish steak and sautéed vegetables. I felt satisfied and proud of myself. I came back from a trip to the bathroom to find that the restaurant owner gave us free deserts. Not what I needed. I ate it. It was worth it. 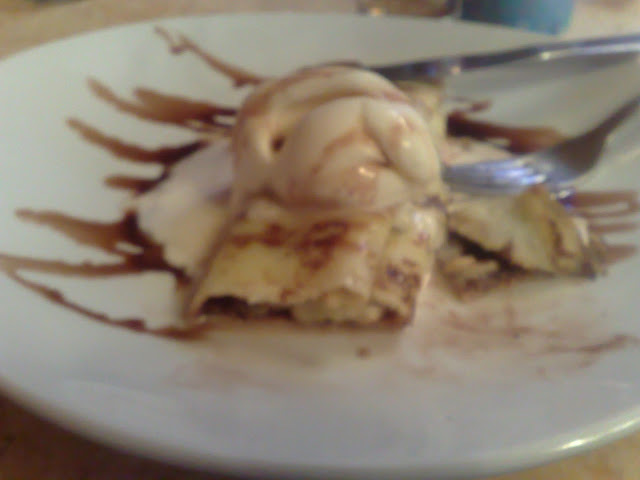 Banana and nutella filled crepe with a scoop of vanilla ice cream on top. I don't know if that's why I didn't lose this week or not but I'm ok with it. I can't imagine life with no deserts, ever. I hope next week is better. I know what you mean, Mona, about being afraid of losing your motivation and also, about not being able to live without dessert. I can totally relate. You've been doing awesome, though. As you said, it's inevitable the weight loss won't be totally awesome every week. Keep it up! You're inspiring me! I've been following your progress! I think it's great what you are doing, Mona. Good job! I find from my experience that the best thing is to teach yourself how to eat. So if you had dessert on Monday, maybe eat lighter the next day (at least for breakfast and lunch). Don't worry! Remember there's water weight etc. Umm Omar, Thanks, I'm not quitting, just need to keep going. Organica, Thanks, Yea I definitely ate light the next day. Jaz, thanks, yea here's hoping. ISA you will do better next week. Please please don't loose the drive. Just think of how awesome you will be once you have lost all the weight. Jessyz, Thanks, I hope so. Mona, I am proud of you for doing so well! It is normal to fluctuate a bit week to week. Hormones change, your body is adjusting, etc.. I think dessert once in a while is great, because if you stop having the fun stuff forever, you won't want to keep to the program. Go Mona Go! You know we'll always be here supporting you in your effort to become healthier. Anon/Lizze, Thanks, yea exactly, I don't want to deprive myself to the point of quitting.